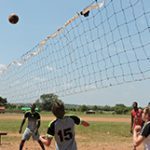 Peace Fields Project Games 2017 were a big success during the visit of students from Ypres, Belgium. Kasim-Tampionaa Saeedand, said, ‘everyone enjoyed the experience and made a lot of friends’. 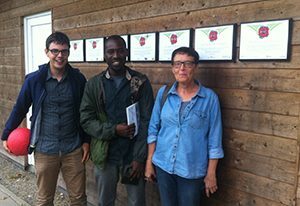 (Left to right) Simon Louagie, Head of Education, Peace Village, Kassim-tamponiaa Saeed, Assistant to Ieper-Wa Sister City Relations and Veronica Lewyllie, Ieper Municipality North South Ambassador in charge of the Twinning (sister city relationship) with Wa in Northern Ghana. Veronic is the Ieper Municipality North South Ambassador in charge of the Twinning (sister city relationship) with Wa in Northern Ghana. Ieper have created a very dynamic and proactive civic relationship to assist practical development opportunities between communities. Of course football is a major unifying opportunity for both parties and the ‘First Shots Fired’ out of Africa story gives historic context to The First World War relationship that can bring both parties together over the Centenary Period to share in the spirit of the 1914 Christmas Truces. 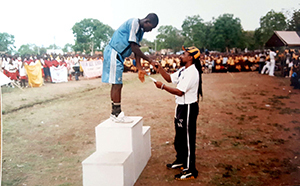 P.L.A.Y (Participation In the Lives Of African Youth) (GHANA) was set up by Kofi Bawuah, a football coach by profession in 2004. P.L.A.Y (Ghana) was set up to bring to the forefront the neglect of the youth in the development of sports/football in Ghana. P.L.A.Y serves as a mouthpiece for children in terms of the amenities they lack to assist in their development through childhood play, lack of trained technical personnel, lack of playing fields, physical education not being part of the school curriculum. Also P.L.A.Y is in the forefront of the campaign to encourage internal school sports rather than out of school which is the norm in Ghana. The Aim of P.L.AY. 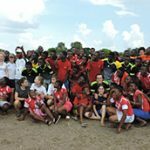 Ghana is to encourage Government and the major stakeholders about the need for children to be allowed to play free of any adult influences or barriers. In the face of aggressive marketing and consumer campaigns this has been a global concern for many years with many childhood issues shared with education authorities. Currently P.L.A.Y. 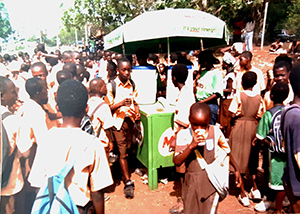 Ghana have a permanent staff of four Kofi Bawuah, Kwabena Antwi, Barima Sarpong and Evelyn Akuffo, we have a maximum of ten volunteers who work on project by project basis. The current number one issue is the lack of playing fields for children to play on, also important is the disappearance of physical education from the curriculum as most schools springing up now have no pitches or parks for the students to play on. We are lobbying the Ghana Education Service to make it mandatory again that all schools should have these basic essential facilities. P.L.A.Y. Ghana will be seeking to twin designated areas of play with Flanders Peace Field, Messines, Belgium, site of the 1914 Christmas Truces. Through the Peace Fields Project the children would be educated on the sacrifices that our forefathers had made in order for them to have peace. 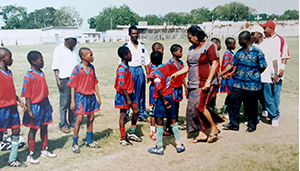 It would also serve as a reminder not to take peace for granted and that the need for each of them to be peace ambassadors using sport as the vehicle. The Peace Fields Project is important because football is the very popular in Ghana and with the elections approaching having a week dedicated to the children we would be able to put our message of PEACE, before, during and after the elections to the masses through the activities lines up including a lecture by the children on football and how it can be used to promote peace. We would also have a strong internet and media presence during that week. We intend to interview children on their thoughts on the upcoming elections and how it affects them. Most importantly we would appeal to owners of pitches / astro turfs and parks to allow children to use their facilities for free. Selected schools would also be competing for the maiden ASOMDWEE (PEACE) CUP MATCH. ASOMDWEE means PEACE in our local dialect and because it would be competed for on that day we chose to name it in our local dialect as the day is also known locally as FOUNDERS DAY and it is a holiday. One of the major benefactors of our programs has been the 5 Garrison Schools which is made up predominantly of children who’s parents are serving in the army. We have run their inter schools programs for them, helped upgrade some playing fields and even included them in the FC Unity campaign with Yamam Nabeel. 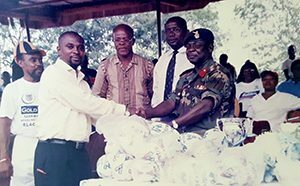 We invited him to Ghana with the PEACE BALL and hosted an event within the Burma Camp Army base.